The BLUElink project became operational in 2007 from the collaboration between the Australian Bureau of Meteorology (BoM), Royal Australian Navy (RAN) and the Commonwealth Scientific Industry Research Organisation (CSIRO 2010). Operationally, it is now under the management of the Australian Bureau of Meteorology. There are several components to the BLUElink system, including operational forecasts, reanalysis and data assimilation. The operational forecasts from BLUElink used in this study were derived from the Ocean Model Analysis and Prediction System (OMAPS-fc). 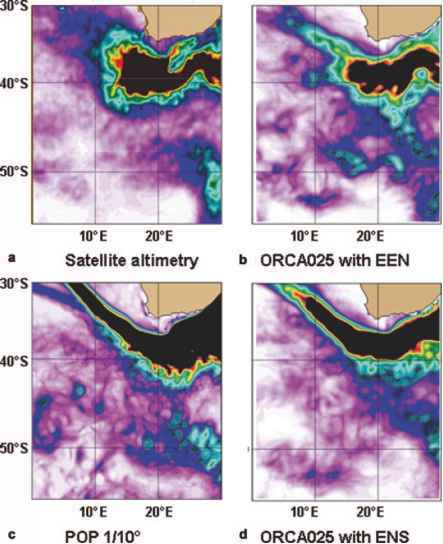 This system uses the Ocean Forecasting Australia Model (OFAM) which is based on the Modular Ocean Model version 4 (MOM4) (Andreu-Burello et al. 2010). The 3D model has a resolution of 1/10° (~10 km) in the Australian region (90°E-180°E, 75°S-16°N), with up to 2° resolution elsewhere around the globe, to reduce computational costs. There are 47 vertical layers, with the topmost 20 layers being 10 m thick. (Australian Bureau of Meteorology 2007) Data assimilation is controlled by the BLUElink Ocean Data Assimilation System (BODAS) which is an ensemble optimal interpolation (EnOI) scheme that assimilates Sea Surface Temperature (SST), Sea Surface Height (SSH) and temperature and salinity profiles. Atmospheric fluxes are currently provided by the BoM Global Atmospheric Prediction System (GASP) (Brassington et al. 2009). The BLUElink system provides up to 144 hour forecasts of the sea surface current velocities, at 24 hour intervals.